The open rate for email is 25% on average. The reach of a Facebook post (without paying to promote it) is approximately 5% – 15%. The reach of a tweet is almost impossible to determine. If you buy promoted tweets, you’ll receive impressions data but not reach data. How many of your customers see what you post to Instagram or Pinterest? Who knows? That’s unicorn math. What portion of your customers will read any given blog post, or download any given ebook, or attend any particular Webinar? Your results will vary, but this blog generated 864,000 unique visitors in the last 365 days, but even the most popular post (about social media strategy) was viewed just 49,000 times. Thus, my MOST popular piece of content in the last year reached just 5.6% of my total annual audience. You simply cannot rely upon any one tactic to consistently reach the majority of your audience; consumer attention and behavior are too fragmented. 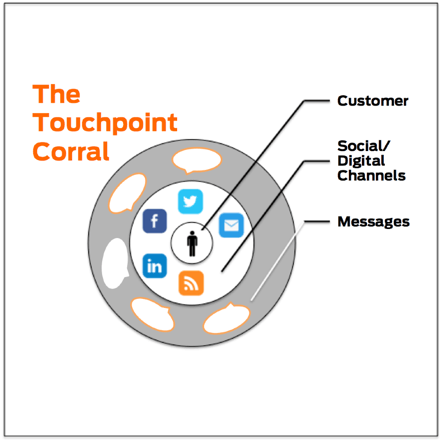 You need to instead build a touch-point corral that allows you to surround your customers with messages from multiple venues and modalities. The goal shouldn’t be to connect with the most number of people by growing your Facebook like count or email database. The goal should be to increase the number of different ways your brand is connected to every single person that cares about you. That way – even though you can’t rely on any one particular message in any specific channel to reach your audience – you maximize the likelihood that SOME message in SOME channel will reach each audience member. p.s. – if you want to dig deep on this concept of proprietary audience development, grab the new book Audience: Marketing in the Age of Subscribers, Fans and Followers by my good friend (and Social Pros podcast co-host) Jeff Rohrs. It’s out this week.